The design of country houses has been influenced by many things but it’s unusual for an insect to do so. Yet the humble butterfly has inspired some remarkable houses, and for one lucky buyer, there is currently the rare chance to purchase Happisburgh Manor, one of the best versions of the ‘butterfly’ house. Although often thought of as a 19th-century/Arts & Crafts plan, the ‘butterfly’ actually has a single precedent dating from 1612-20. The definition of a butterfly plan house is ‘…where two or four wings of a house are constructed at an angle to the core, usually at approximately 45 degrees to the wall of the core building.‘. The house which was the first manifestation of this plan is Westwood Park, Worcestershire, which, it is thought, was originally built as a conventional rectangular, three-storey hunting lodge. It was begun in 1612, but sometime before 1620, though probably not originally planned, four full-height wings were added at 45 degrees, creating the distinctive shape we now know. The reason for this innovative design is lost but is quite likely to be a response to the elevated location. The butterfly plan is also known as the double-suntrap as it increases the number of rooms which benefit from their orientation towards the sun and increases the number with views; hence its popularity with any number of seaside hotels. Despite these advantages, the butterfly wasn’t to make another appearance for nearly three centuries until it appeared in Northumberland in 1891. The butterfly in this case was a house called The Chesters, which had originally been built in 1771 but which the leading Victorian architect Richard Norman Shaw had been commissioned to dramatically enlarge. Where the butterfly plan found its best expression was in the hands of the Arts & Crafts movement , whose love of natural forms perhaps gave them a greater sensitivity to the opportunities it offered. In 1902, Edwin Lutyens was commissioned to remodel an existing house in Leicestershire called Papillon Hall, named after the original Huguenot family. Conveniently, ‘papillon’ is the French for ‘butterfly’ and Lutyens would have been aware of the architectural innovations going on elsewhere and obviously felt he would try his hand at this novel plan. However, Papillon Hall was not to last long, being demolished in 1950 with only sparse rubble showing where was once one of Lutyens’ most interesting commissions. Started just after Lutyens’Papillon Hall was finished, E.S. Prior’s commission for Voewood, Norfolk, was perhaps his most successful use of the design. Built between 1903-05 for the Rev. Percy Lloyd, this was a radical house; pulling together a fully developed butterfly plan, hyper-local materials, and superb craftsmanship. Pevsner described it as ‘a most violently idiosyncratic house‘; rich in local texture provided by a varied palate of materials mainly dug from the ground on which it stands. The house unfortunately was tenanted almost as soon as it was built (apparently Lloyd’s wife didn’t like it!) before becoming a boys school from 1906-1914/15 and then a series of care and convalescence homes until it was bought around 10 years ago by rare book dealer Simon Finch who was exactly the right character to sensitively restore the house and make it a home again (though it can be rented). For all its charms and advantages, the butterfly house only enjoyed a relatively brief period of popularity. After World War I, the popularity of Arts & Crafts sadly declined and architects moved away from suggesting it and instead largely headed back to the comfort of the classical or the more radical art deco, putting the butterfly into hibernation. However, no good architectural idea is ever completely forgotten. 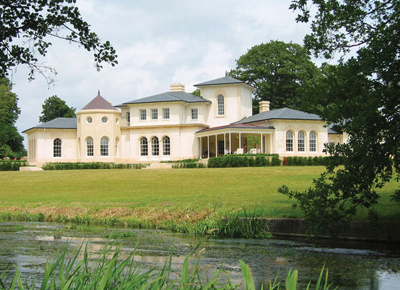 A recent manifestation is Robert Adam’s response to the demanding requirements of a client who wished to maximise the views from a riverside site. The architect’s website is sparse on details of both its name, the year that it was built or the exact location but it blends elements of the Pictureseque, with varied forms and heights, whilst still adhering to the butterfly shape. Again, perhaps this shows the adaptability of this innovative plan. The butterfly plan is complex and requires great skill to be manipulated correctly to achieve the correct balance internally and in the use of materials, which probably explains why it was never broadly adopted. Short of commissioning your own, the chance to own a true ‘butterfly plan’ house is certainly a rare one, especially when the architect was one of the leading exponents of the idea who also ensured that the build quality was exemplary. Happisburgh Manor has been for sale for several months and the price was recently cut from £975,000 to offers over £800,000. This may reflect market weakness but also that, although freehold, Happisburgh is in danger from coastal erosion which may see the house become a beach-hut within the next century (but maybe longer, who knows!). This would be a tragic end for this rare and special house and one can only hope that the next owners fully appreciate the beauty of their home and perhaps can find some way to save it – but in the meantime they, and the next generation at least, will be able to enjoy a superb house in a wonderful location for years to come. Matthew Beckett runs two of the UK’s most visited websites dedicated to country houses; ‘The Country Seat‘ which covers news and history relating to existing houses and ‘Lost Heritage‘, a project to accurately record all the demolished country houses of England. In total, these websites are expected to be visited by an estimated over 150,000 unique visitors this year who will have looked at over 800,000 pages.